I turned 30 on Thursday, which I guess means it’s time to look back on the last decade. I spent the first night of my 20’s in a dorm room bed as sick as I ever remember being, puking my brains out. I spent the last night of my 20’s sitting on my couch holding Ella while Jack puked all over the place. Somewhere between those two nights of puke I graduated from college, got a job, moved to San Diego, got married, bought a house, got a dog, bought a business (and closed it), and had a couple of kids. Two-thirds of those events happened in the past two years, so I guess I sort of crammed everything in right at the end. I have a feeling almost all of my accomplishments in the next decade will start with either “Ella did this” or “Jack did that”. Call it a hunch. Thursday (my actual b-day) was pretty quiet. Shae made me my now-traditional birthday tacos for dinner, and a two-crust lemon pie for dessert. After that, it was just a quiet night of movie watching at home. The real fun happened on Friday. Thanks to Chris’ sister Kat, we had a babysitter for the night and could actually go out on a date. Shae and I dropped off the babies and headed off to dinner. Now, when I say “dropped off the babies” what I really mean is carried in babies (and all their stuff), setup the Pack-N-Play, and spent about 15 minutes going over every possible baby scenario with Kat. After we were done with baby boot camp, we headed down to Seaport Village for a quiet dinner for two. It was very nice for the two of us to get out for a nice dinner and not have to deal with the twins. I love my babies, but it is definitely nice to get a break every so often. After dinner, it was off to the Comedy Palace to have a few laughs. We met up with Chris, Patty, and Erica at the “Palace”, ordered a few drinks (2-drink-minimum), and enjoyed the show. Most of the comics were the same as the last time we went (a couple of months ago), but the majority had new material this time. I had a great time, and I think everyone else did too. After the show was over, it was off to pick up the munchkins. We got to Chris’ house and found the babies bathed, changed, and asleep in their pajamas. Nice. We should do this babysitting thing more often. After driving home and putting the babies down it was time to head to bed and call it a birthday. Now it’s time to see what the next decade has to offer. So far, it’s had a lot of poop. Well, there’s been a lot going on lately so I thought I’d give a couple of quick updates. Shae already wrote up an update on the babies, so I thought I’d give an update on the rest of the household. Shae and I are tired (especially Shae), but we’re doing fine. Now that The Learning Garden is closed, Shae is home full time with the kids and is definitely staying busy. My dad and Dorothy came down to San Diego last weekend for a visit. It was a pretty laid back weekend, but there was lots of baby holding and some good visiting. My dad and I were able to sneak out to Rocky’s for a burger on Sunday morning, so that was nice. I was starting to think I wouldn’t be able to have another Rocky’s burger until the babies were 21. Other than that, not a lot to report. Like I said, lots of baby holding and lots of visiting. Oh, and yet another visit without anyone hurting themselves climbing up or down the guest room stairs. Everyone always talks about how things change once you have kids, but I didn’t truly understand how much until recently. It really hit me when I found myself writing an email to iTunes customer support about a week ago. The reason for my email: three of the tracks from”Rockabye Baby: AC/DC” didn’t download properly. That’s right, my lullaby renditions of “Dirty Deeds Done Dirt Cheap”, “Highway To Hell”, and “You Shook Me All Night Long” wouldn’t play. How can my babies get to sleep without AC/DC lullabies? I’m not sure how the support person kept a straight face long enough to reply to me, but sure enough the next day I had new copies of the songs and the babies could rock out to the full album. That’s about it for the update. I also found time to turn 30 and take a couple of hikes in the last week, but those will get their own posts. I figured it was time for a baby update. At just over three months old, Ella already has a HUGE personality. Most mornings she will wake up with a huge smile and a cute little laugh. Now I say most mornings. On the other mornings she wakes up screaming her head off. I guess you could say she is a typical woman. She is also doing the squealing thing. She will lay there for hours just squealing. We had a sales person come to the door the other day and she asked me if I had a baby because she could hear her all the way across the street. Ella is also doing a lot of kicking. I have a feeling she will be crawling before we know it. She has yet to roll over, but she tries. I haven’t had her on her stomach as much as I should so I think that is partly my fault. Our little girl also loves to “talk” now. She thinks she is having a conversation with us, but I still have no idea what she is saying. Her favorite person to talk to is Lunchbox. When she sees him in the morning, she gets so excited. Now for the not so good stuff. The evenings can be rough for her. She will get in a crying cycle. I think she gets a little gas bubble, then starts crying and makes it worse. It will get to the point where no amount of comforting will help her and she won’t eat. The only thing I have found that helps is Gripe Water. Give her a little bit of that and it calms her right down. The other not so good thing with Ella is that she is losing her beautiful hair. She has bald spots on the back of her head and some on the top. The ones on the back are from sleeping and the ones on the top are from her cradle cap. Yup, she has cradle cap. It is this gross scaly stuff on top of her head. I guess the dry skin does not fall off and just builds up. It can sometimes make babies hair fall out. Our poor little girl is turning into an old man. I guess that is it on Ella. She is a happy beautiful girl. Jack is just awesome. He wakes up with a big smile and a cute little laugh/grunt thing. He vary rarely cries. If he does cry, we know there is something wrong. Usually he is hungry or trying to poop. I keep telling him that if it makes him cry then it probably isn’t ready to come out yet. He doesn’t seem to believe me. Jack is also HUGE. He has to be at least 2 pounds heavier then Ella. He looks like he is turning into a little bruiser. Jack went through a phase where he lost all his hair on te top of his head but it has all grown back now. Jack is also not rolling over yet and hates to be on his tummy. He has reflux so it really bothers him to lay that way. Just like Ella he is kicking up a storm. Jack tries to talk, but isn’t as good at it as his sister. In a couple more weeks I have a feeling the two of them will be having full conversations with each other. Now for the not so good stuff. Like I said before, Jack has reflux. If you are not familiar with it, then that is a good thing. Basically a muscle that keeps his food down is not developed enough and he throws up a lot. We can’t just feed him. We have to try and burp him after every ounce of food he eats. It can be a pain. We have had to stock up on burp rags to clean up all his puke. He also projectile pukes. We now have a nice big stain on our couch and he has been able to hit his sister in her bassinet from his. He can really get some distance. Both babies are still not consistently sleeping through the night. They take turns and it is really annoying. I think they have both slept through the night twice since they have been in their own room. I know they are both capable of it, they just don’t want me to get any sleep at night. I guess that is it for a baby update. They will have a 4 month check up at the beginning of February so I will have more then. 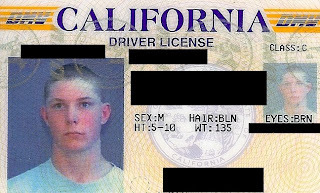 Pretty much every teenager dreams of turning 16 so they can get their driver’s license. Of course, these days I think you have to be almost 52 before the state of California will let you actually drive a car without some restriction or another. Luckily for me, the only problem I had getting my license was that I turned 16 during wrestling season. It’s hard to get down to the DMV when you have practice after school every weekday and tournaments every Saturday. Well, the first Monday after the end of wrestling season (sometime in April, three months after my birthday), I got myself and my ’85 LeBaron down to the King City DMV right after school, took my driving test, and got my license. I was so happy to have my license that I didn’t even notice that they somehow turned “green” into “brown” for my eye color. I get those words confused a lot too. Very similar. Unlike some people I know (and am married to), I haven’t “misplaced” my license 4 or 5 times over the past 14 years and since I haven’t had any tickets that affect my driving record I’ve been able to renew online whenever my license expired. So for 14 years my license has featured my 16-year-old face on it, along with my wrestling season weight and the wrong eye color. I’m not sure how I ever got into a bar with that license. What is the point of checking IDs if you’re going to let 225 pound guy with green eyes in using a license that says he weighs 135 and has brown eyes? I guess they figured if I were going to get a fake ID it would look more like me than the pic on my license so I never had any issues other than a few raised eyebrows. In fact, until last Friday I hadn’t set foot inside a DMV office since that April afternoon in 1995. I guess the state of California has decided that 14 years is the most you can go without going back in for an eye test and a new picture because I finally had to pay the DMV another visit. I want to know who the genius was that decided you can go from 16 to 30 without ever getting a new picture or an eye test. I’m not complaining about avoiding trips to the DMV, but it seems kind of ridiculous that I’ve been using the same ID since 1995. Since appointments were booked at all of the local offices until the end of January (after my license would expire) there I was at 7:45 AM Friday morning standing at the end of the line in the cold (well, cold for San Diego). It was definitely an odd mix of people in line, but my favorite group was the mom, daughter, and son/daughter’s boyfriend standing about three places in front of me in line. They were there to get the daughter her license and both mom and daughter must have been nervous because they were smoking like crazy. Something about the mom and 16-year-old daughter smoking together before the daughter’s driving test just seemed funny to me. I wonder if the daughter smoked in the car during the test. The end of 2008 was also the end of The Learning Garden. Between the babies taking up all of Shae’s time and the crappy economy taking all of our customers we decided it was time to close up shop. We spent most of the week between Christmas and New Year’s eve trying to get everything cleared out of the office by the end of the month. We sold everything we could, brought home tons of stuff we couldn’t sell, and threw away about a dumpster worth of old crap. It was a ton of work, but the babies helped and we got everything done just in time. When Shae and I bought The Learning Garden a year ago, we had all kinds of ideas on how to get the business back on track. Shae did a great job, and for the first couple of months things were pretty good and she brought in quite a few new students. Then Shae found out she was pregnant and her focus shifted more towards growing babies than TLG. She still taught and put in tons of work running everything, but after a few months of baby-carrying she just didn’t have the energy to get up early every morning and go in to do all the extra work/marketing that was needed to stir up more business. Of course, then the gas prices skyrocketed and all of the longtime customers who had to drive down from North County stopped coming. As the economy has taken a giant dump parents have decided they just don’t have the extra money to spend on tutoring, and over the past few months business has trickled to almost nothing. We finally decided that it was time to just throw in the towel. My feelings about closing down TLG are mixed. Part of me is sad to see it shut down. A year ago Shae and I were very excited about running our own business and were very optimistic we were going to be successful. It’s disappointing that it didn’t work. However, a larger part of me is OK with everything. Shae is happy she gets to spend more time with the babies without worrying about how we’re going to pay The Learning Garden’s rent the next month, and she’ll probably do some tutoring out of the house for some of her students. It would have been nice to have a wildly successful business, but I guess we’ll just be happy with two babies. Well, the babies made it through their first Christmas with flying colors (and Shae and I somehow survived too). It’s been kind of crazy around here lately with grandparents, Christmas, the New Year, trips to the zoo (more on that in another post), and other stuff (more on that in another post too), but I finally have a few minutes to try and recap Jackson and Ella’s first Christmas. We posted some pics from Christmas over in our gallery. Monday (the 22nd) my Mom and Shae’s parents got into town. I’m sure there’s all kinds of stuff I should say about how great it is to get together with our families for the holidays and all that, but really I was just happy we had three new people to hand the munchkins off to. So with all these people to watch the babies you know what happened the first morning everyone was here? Shae and her dad went Xmas shopping and the grandmas went shopping and I ended up alone with both babies for half the day. How does that happen? Tuesday night as we were preparing for bed Shae just blurted out “I think the babies are going to sleep through the night tonight.” The fact that Ella had slept through the night about three times ever and Jack hadn’t even really come close didn’t seem to change her feeling. After I pointed these facts out to her and mocked her for thinking there was any chance we would get a full night’s sleep we turned off the lights and drifted off. Sure enough, both babies slept through until Lunchbox woke us up at 6 the next morning. Fresh off a full night’s rest it was time for Christmas Eve. After a pretty laid back day we headed over to John and Leah’s (Grace’s aunt) for their Christmas Eve party. The babies were a big hit (and I found even more people to pawn them off on), and I got to meet a few more members of Shae’s family. After the party, it was home to get everything ready for Santa and get Jack and Ella to bed. Everything went pretty smoothly, and although the twins didn’t both sleep through the night (they haven’t repeated that trick yet) they were pretty good. Jack must have known it was Christmas morning because he started the day off with a nice present for me: a nice morning dump. Jack must be a big fan of Christmas (or he felt really good after his poop and puke) because he busted out his first real smile for us. He’d given us little grins before, but on Christmas morning he let loose with a great big smile and kept smiling at us for about 10 minutes. Ella has been smiling for a while so she wasn’t very impressed, but the rest of us were very excited. After Jack was done smiling, it was time for the really good stuff: opening presents. Instead of recapping everyone’s presents I’ll just say that everyone got lots of good stuff (especially me). Thanks everyone. The babies got lots of goodies, but since they got so much stuff at their showers Shae and I got to reap the benefits. I think this will probably be the last year we get much for ourselves, but it was a great Christmas. That’s about it for the recap. I’m sure I forgot to mention tons of stuff, but the babies are crying and need some attention. It’s a week late, but Merry Christmas everyone!